1. ‘Bill Gates is inextricably linked with Microsoft and he is perceived positively’ [If Robert Mugabe gave $37B to charity he would be seen positively too]. So they’ve created this campaign with Seinfeld and Gates, who are not, it turns out, the next Abbott and Costello. First ad. Second ad – runs 4.5 minutes. Even if this campaign worked better (Gates is not an actor and the script is at best, mildly amusing) it’s strategically flawed. 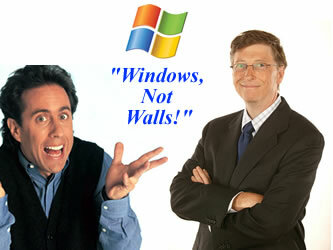 Windows is the number one operating system in the market by a factor of ten. It’s not healthy for them to be responding to the number two guy. Besides, how are you going to out-cool Apple? Apple make cool hardware. THINGS that look cool. Play music. Have innovative interfaces. You are not going to overturn that with lame sit-com humour and nothing to back it up. 1. Personalise Microsoft by interviewing their bright young computer scientists. Let them talk about the projects they’re working on. Show off Silverlight and Sea Dragon and other cool software technologies. Replace the Gates image with young, smart people. 2. Associate Microsoft with business use. Find some personable execs with business stories that highlight the increased productivity that Windows has delivered. But make them REAL people and REAL stories. Don’t patronise us and don’t shove it down our throats. Hard to know what the right direction is without access to research but the current campaign does not have enough humour to overcome the lack of authenticity. It’s more spin when what they need is to be more grounded.